12 Days of Christmas Nail Art Challenge!!! Hi lovlies! 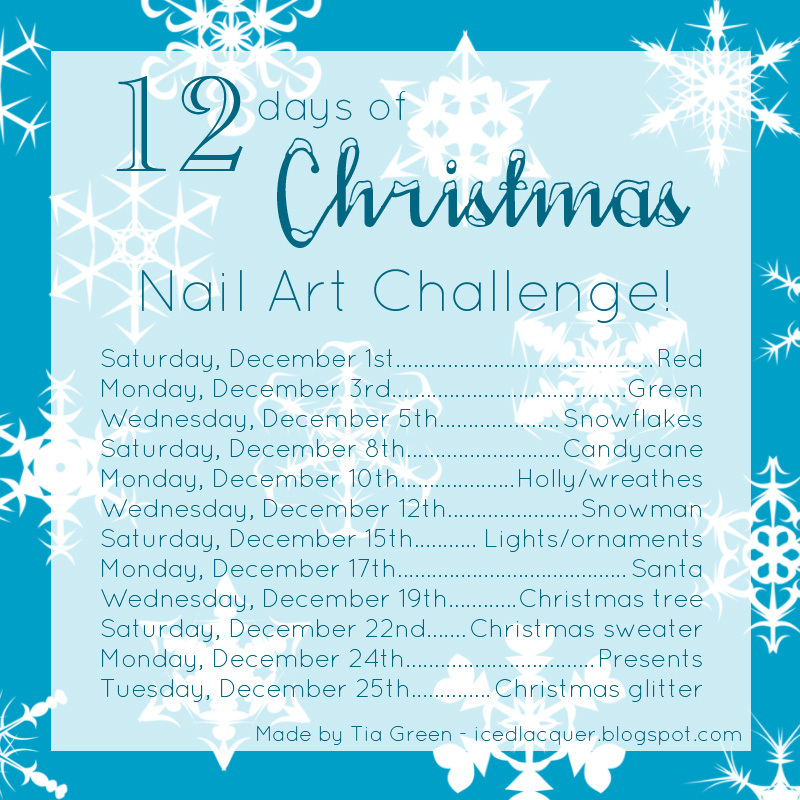 I've seen a few holiday themed nail art challenges floating around and decided to make one of my own! This will start on the 1st of December (this coming Saturday) and will have three challenges per week up until the 25th! I tried to pick some easy ones and some that are a little more challenging to mix it up. If you would like to join me, let me know because I would love to link back to the people who are doing it with me! Even if you can't complete each one, this is just for fun! I'm really excited for December to begin and to do some adorable manicures for the holidays! That's ok, I totally understand! I've never done one of these so I'm hoping I can finish it! Aww, you're a sweetie! :D I thought it would be super fun, especially if a bunch of us can do it together! I would like to join you!! I love this time of year and all the glitter makes me smile!!! Everything is sparkley!!! I have a facebook and blog called Glitter Me This...http://allthelittleshinythings.blogspot.com/ in case you need it for a link!!! Can't wait to get started!!! I would love to join this challenge! My blog is A Ginger's Nail.. (http://agingersnail.blogspot.com/) You picked some good ones! Can't wait! Oh! I'd love to join in on this! I'd like to join! This challenge looks fun! I've yet to do any challenges. Why not start with a Christmas one! :) my blog is super duper new. Looking forward to the next 12 days! Hiya, I would like to join you as well :) I will be have quite a busy month, as I am taking part in a few other challenges, but I will try to be on time with my posts.